Following the great successes of previous symposia in this series in Bari, Italy in 2017 http://bari2017.moniqa.org/ and Vienna, Austria in 2018 http://vienna2018.moniqa.org/, the MoniQA Association and USP (the United States Pharmacopeia) would like to invite you to the 3rd International MoniQA Symposium on Food Fraud Prevention and Effective Food Allergen Management scheduled on 30 October – 1 November 2019 in Rockville, MD, USA. An exciting program with practical litigation cases, with strategies and methods for detecting and combating food fraud, are presented by renowned speakers from around the world. Join us in Rockville and meet the "Food Detectives" and get to know modern technologies that are looking for the "unknown" and learn about legal regulations and get practical advice for protecting your branded products, for correct food labeling, and ultimately to maintain consumer trust. The symposium program is currently being compiled, it will include speakers from Science and Innovation, from industry, public authorities, international organizations, law firms and food research institutions. In addition to the traditional main topics related to food fraud prevention and effective food allergen management, the 3rd edition of this International Symposium will also focus on the Food Law, its implications for industry and food businesses in international trade, export and import liabilities, critical issues of food integrity and food safety related issues governed by national and international regulations and standards, impacts of international trade agreements. This symposium will address food authenticity, food fraud and the need for simple labeling as major drivers for both the food industry and companies involved in rapidly developing new analytical technologies, and putting available analytical tools in perspective of private standard requirements. While the food industry must adapt its programs addressing food safety and quality to meet the ever-changing regulatory and legal landscape, law firms specializing in food issues must also ensure their knowledge of these changes is up-to-date when defending the rights of consumers and/or food producers. This workshop will bring together food industry experts, legal experts, regulators, academics and nongovernmental organizations (NGOs) to discuss the latest information on the implications of regulations and other burning issues in the food space. Additionally, recent technological developments in food analysis, digital certification and brand protection will be presented. We warmly invite you to attend this meeting in Rockville, which brings together international experts in the fields of food authenticity and food allergens, as well as various food industries, SMEs, research institutions, associations and regulatory bodies, all having a different stake in food safety. This special mix of scientific and practical input to the symposium will be a valuable opportunity to grow your knowledge base, learn from practical experiences, and exchange ideas with peers. Technical session on food integrity, food authenticity, food fraud, food fraud databases, food profiling, food analysis and latest analytical innovations, reference materials. Requirements of public standards for allergen management and food fraud prevention. Technical session on food safety and the law, litigations, trade agreements, liability, brand protection, consumer protection, export and different national laws, digital certification and blockchain. Technical session on food allergens and labelling, food allergen management, gluten free, economic and food safety implications, analytical methods/challenges, reference materials. Different regulations, introducing different risk assessment tools for food producers, food vendors, authorities, and clinicians. Food allergen management in practice. Challenges with hand held devices for risk management by consumers, liability implications, recalls. We hope to see you in Rockville in October/November 2019! A Happy New Year to the members and supporters of MoniQA! The past year has been an interesting and exciting one! The topics MoniQA covers have never been more current: food allergens, food fraud and reference materials. No matter which jurisdiction you turn to, all of them have food fraud and food allergens high on their agenda. This also became apparent during the successful MoniQA conference held in Austria, and attended not only by the food industry, patient groups, laboratories, assay providers and equipment manufacturers but also by high-level FAO representatives. And as a not-for-profit organisation, MoniQA is well-placed to address challenging aspects of these topics in an independent manner. Richard Cantrill, the outgoing president, has clearly shown his leadership, guidance and commitment over the past year and I would like to thank him on behalf of the advisory board and the MoniQA member companies and organisations. In the coming year, MoniQA will continue on the path, helping stakeholders to address food safety challenges. The MoniQA team is already working on a number of new initiatives. If you like to learn more, I cordially invite you to join the organisation and help pave the road to safer foods! Wishing all members and supporters a happy and prosperous 2019! I am certain as I hand over the Presidency of the MoniQA Association to Bert Poepping that the future for the organization is very bright indeed. With the help of the Supervisory Board and Secretary General Roland Poms, we have been able to broaden our horizons in the areas of food fraud and allergen management. I was involved with MoniQA from its start as a Network of Excellence and now as a member-driven organization and am proud to have served as President. Now as immediate Past President, I have taken on the role of Editor-in-Chief of QAS (Quality Assurance and Safety of Crops and Food) and encourage you all to support this flagship MoniQA publication by submitting papers and also providing peer-reviews for our many submissions. Thank you for your commitment to the Association and I wish you a successful and prosperous 2019. 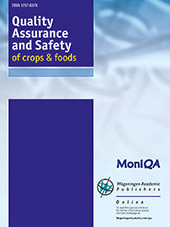 The first 2019 issue of QAS – Quality Assurance and Safety of Crops & Foods, the official international journal of MoniQA Association published by Wageningen Publishing – is now available online https://www.wageningenacademic.com/toc/qas/11/1. The editorial by Richard Cantrill, Past President of MoniQA Association and the new Editor in Chief of QAS is offered as open access paper and the full version can be downloaded at https://www.wageningenacademic.com/doi/pdf/10.3920/QAS2019.x001. “Following my review, the editorial board and MoniQA supervisory board have agreed to small but significant changes to the scope of QAS. The revised scope and submission requirements can be found online (https://www.wageningenacademic.com/journals/qas/general-information). As a result of this review, we will maintain our current core subjects related to crops, crop improvement and conversion of crops to food, but will also place a greater emphasis on food composition, food safety and quality and the interaction between food quality and the regulation of global trade. To illustrate this broader coverage of food safety and quality, QAS is publishing a special issue in 2019 consisting of papers from the Global Harmonization Initiative which advocates for ‘science-based food safety law and trade’. To read the full article please go to https://www.wageningenacademic.com/doi/pdf/10.3920/QAS2019.x001. Roland Poms, Secretary General of the MoniQA Association will give his yearly lectures on "Reference Materials and Method Validation in Food Safety Assurance" at BOKU - University of Life Sciences and Natural Resources, Vienna, Austria, http://www.boku.ac.at/en/, in the week from 25 February to 1 March 2019, 12:30-16:30 each day. The lectures will be given in English and they are specifically designed for international students to meet their curricula requirements for their Master Studies “Safety in the Food Chain” and for PhD students in the areas of food safety, food analysis, reference materials and measurements, and quality control. Participation in the course and passing a final written or oral exam will be awarded with 3 ECTS. This course offers theoretical and practical content and is perfectly fit to complement your CPD (continued professional training) for QC personnel in food industry and auditors. In addition to enrolled MSc and PhD students at BOKU – the University for Natural Resources and Life Sciences Vienna, students of the European Master Studies “Safety in the Food Chain” and international exchange students, there are a maximum of 10 places reserved for MoniQA members (discounted fee for the one week course is € 120,-) . The aim of the course/workshop on "Reference materials and method validation in food safety assurance" is to describe the issues and challenges involved in the international comparability and validity of analytical results in the assurance of food safety and quality. On the basis of practical examples the focus was on current hot topics, such as mycotoxins, food allergens, authenticity testing, pathogenic micro-organisms, GMOs, etc., the analytical possibilities (including rapid methods), and the corresponding EU regulations. Additionally, an overview of international standardization bodies and examples of international validation studies was to be given. The course was offered in the framework of the international Master programme “Safety in the Food Chain (SIFC)”, http://www.safetyinthefoodchain.com/, which includes 5 participating universities across Europe. This international Master programme was developed to provide a profound academic MSc programme concerning all areas of food safety. It offers a high level study course by combining all the existing expertise of European universities. The content of the curriculum is focused on the whole spectrum of the food chain (regarding supply and production). The course is offered in English and was originally compiled in the EU funded MoniQA Network of Excellence FOOD-CT-2006-036337 and further developed by Dr. Roland Poms at BOKU and MoniQA. About 650 participants from some 130 countries were witnessing a strong determination to scale up food safety in the 2030 Agenda for Sustainable Development at the First FAO/WHO/AU International Food Safety Conference, in Addis Ababa, Ethiopia, 12-13 February 2019, which was organized by the United Nations to discuss the future of food safety and how to best transform knowledge into action for people, economies and environment http://www.who.int/food-safety/international-food-safety-conference. Priorities were discussed so that food safety strategies and approaches can be aligned across sectors and borders, reinforcing efforts to reach the Sustainable Development Goals and supporting the UN Decade of Action on Nutrition. Strong and viable food systems require transparency, collaboration and communication. Consumers must be engaged. There is no food security without food safety. In a world of accelerating changes, the need for food to be safe remains a constant imperative. And, in an increasingly complex food system, there must be greater attention to transparency, information sharing and collaboration. Stakeholders from across the food chain share the responsibility for assuring that food is safe. Everyone has a role to play in food safety. With widespread collaboration and the contributions of all actors in the food supply chain we can seek to improve food safety. This is a pivotal moment in which international attention, key actions and strategies can make a difference in the lives of many. A continued participation and dedication to improve food safety will pay off – improving human health and livelihoods, strengthening economies and protecting the planet. In a second meeting at the FAO/WHO/WTO International Forum on Food Safety and Trade, Geneva, Switzerland, 23-24 April 2019, the trade-related aspects and challenges of food safety will be addressed. The two meetings will result in a high-level statement advocating for increased and better coordinated collaboration and support to improve food safety globally. Watch a recording of the LIVE stream of the Opening Session here! In the social media you might want to look out for the following hashtags: #FoodSafety #SécuritéAlimentaire #سلامة_الأغذية#InocuidadAlimentaria and #SafeFood. The 2nd International MoniQA Symposium on Food Fraud Prevention and Effective Food Allergen Management in Vösendorf-Vienna, Austria, 7-8 June 2018, attracted 77 delegates representing all aspects of the agrifood sector. The event was organised by Roland Poms, Secretary General, MoniQA Association, Austria, and his team along with Richard Cantrill, President, MoniQA Association, Canada. The book of abstracts is published as volume 10, supplement 1, in the journal QAS - ‘Quality Assurance and Safety of crops and foods’, and can be accessed free of charge at www.wageningenacademic.com/foodfraud2018. The 3rd MoniQA International Symposium of this series is planned in latter half of 2019. Down below a detailed summary of the meeting is given, thanks to Michael Walker, LGC, United Kingdom, who provided his personal report. The organisers thank all speakers and poster presenters for their excellent contributions. Furthermore, we thank the sponsors of this event and all participants for their active participation! Roland Poms and Richard Cantrill welcomed the delegates and introduced the conference which was an exciting programme of talks mixing cutting edge science with examples of litigation and enforcement. Strategies and methods for detecting and combating food fraud were presented as well as discussion of food allergy and coeliac condition, including precautionary allergen labelling, ‘free from…’, thresholds, laboratory accuracy and class action litigation. It is with great pleasure that the Global Harmonization Initiative (GHI) invites you to attend the 1st GHI World Congress on Food Safety and Security, 24 - 28 March 2019, in Leiden, The Netherlands. 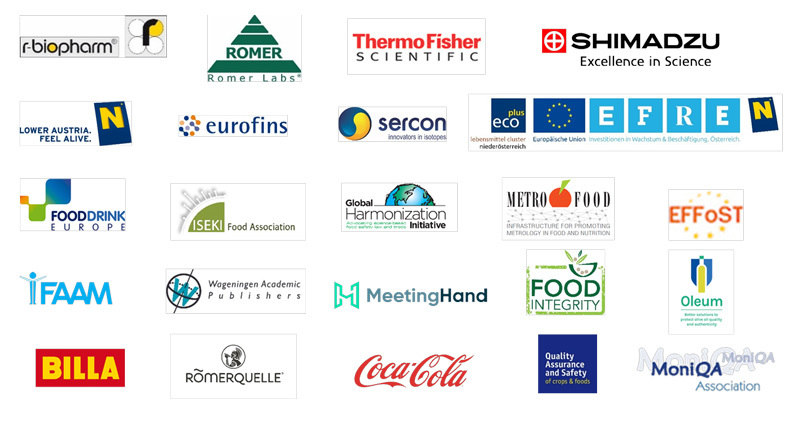 It brings together leading scientists, researchers and research scholars from academia and industry, decision makers from international organisations, and the public from across the globe to advance the conversation about the vital role of modern science in food legislation and regulation. We thank Marina Carcea, CREA, Italy, and Paul Finglas, QUADRAM, United Kingdom, for their support and service in the MoniQA Supervisory Board in the past years. In its latest session of the AOAC International Stakeholder Panel on Alternative Methods (ISPAM) MoniQA’s first allergen reference material validated for use in milk allergen detection methods was included in AOAC’s SMPR (Standard Method Performance Requirements) for the “Quantitation of Milk by ELISA-based Methods”. On 4 - 6 October 2017, OLEUM partners met in Greece for a project meeting to mark the end of the first year of the project and discuss progress and future plans. The meeting was hosted by the Aristotle University of Thessaloniki. Roland Poms is member of the Advisory Panel and attended the meeting on behalf of MoniQA Association. The Multi-stakeholder Advisory Board (MS-AB) of OLEUM met for the first time. The MS-AB will meet annually to act as discussion platform to consult in different aspects of the project. The MoniQA Food Allergen Reference Materials Task Force met on 27 September 2017, 14:00-17:00 at the 131st AOAC Annual Meeting, Atlanta, Georgia, USA. The task force was attended by some 30 participants and discussed the progress and the next steps in the design and production of validated food allergen reference materials. After the first set of milk reference materials became available at the beginning of 2017 (see also http://shop.moniqa.org/), further materials are in preparation. The first validated Reference Materials for Food Allergen Analysis are now available and can be ordered from MoniQA Association by using the online order form and return the completed, signed/stamped form to moniqa [at] moniqa [dot] org.